They are not all deadly and some are quite beautiful. There are not many people that can say they 'love' spiders and it's no secret they are feared, whether you're a true arachnophobe or not. But now the CSIRO is trying to enlighten us about spiders, with a new book A Field Guide To The Spiders Of Australia. 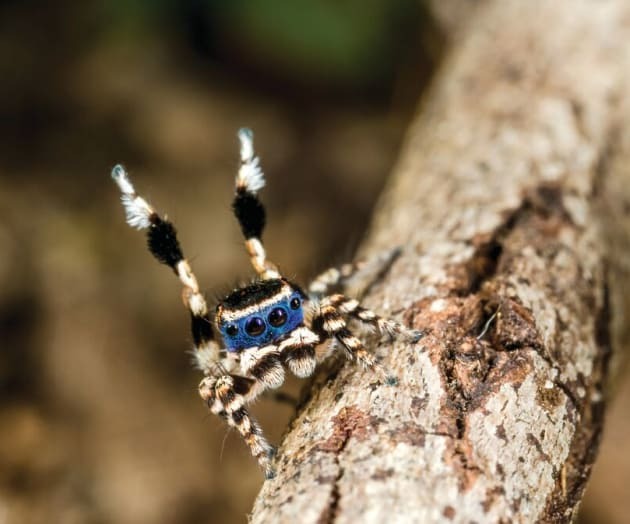 Aside from our justified fears of the deadly red back and funnel web spiders, there is a lot to love about spiders, particularly the magnificence of the dancing Peacock Spiders, the Sparklemuffins, and the Disco Mirror Ball Spiders. Meet the Masked Peacock Spider. The book is co-authored by Robert Whyte, an honorary researcher in arachnology at the Queensland Museum and Greg Anderson, biomedical research scientist at the QIMR Berghofer Medical Research Institute. A Field Guide to the Spiders of Australia features 1350 photos, covering 836 species and it's hoped the book will help diminish some of our common fears. "It can take as little as five minutes to completely cure arachnophobia," Whyte said. "For years now we have been curing arachnophobia with the harmless Golden Orb Weaver, which doesn't even have a defensive bite." "Spiders can do incredible things – some spiders can fly; others mimic other species like ants and wasps to avoid predators; and Disco-mirror ball spiders can rapidly change colour." 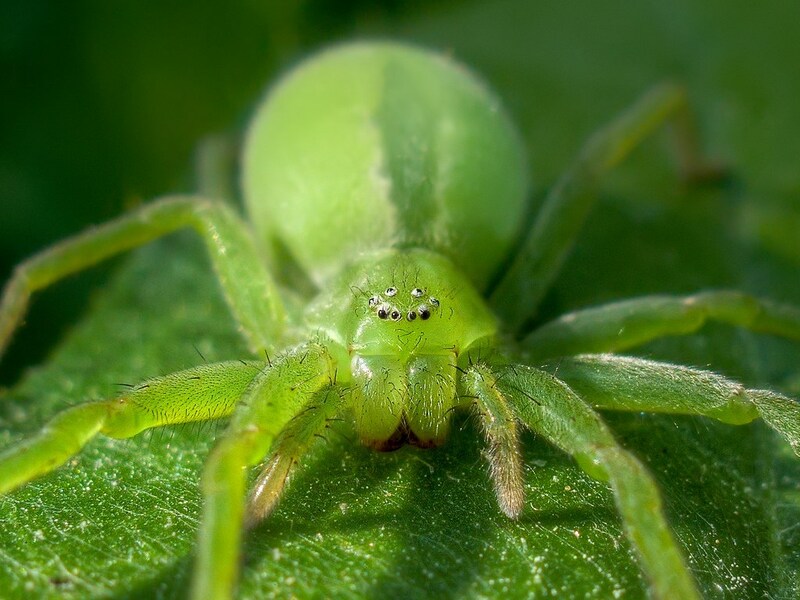 The Green Huntsman has two rows of four eyes. One myth the book dispels is the recurring tale that bites from White-tailed spiders will trigger flesh-eating bacteria -- this, apparently, is completely untrue. The CSIRO wants everybody to know how wonderful spiders are: there are spiders that eat tadpoles, spiders that sit in holes waiting for trip wires to be sprung, spiders that shoot their hair out when spooked, spiders that hold their web in their hands and throw it on prey (like Predator), tiny spider-eating spiders that travel to other spider webs and pluck at the web pretending to be a late-night suitor, spiders that turn pink like flower petals and grab bees arriving to pollinate, and even a vegetarian spider. Who'd have thought? 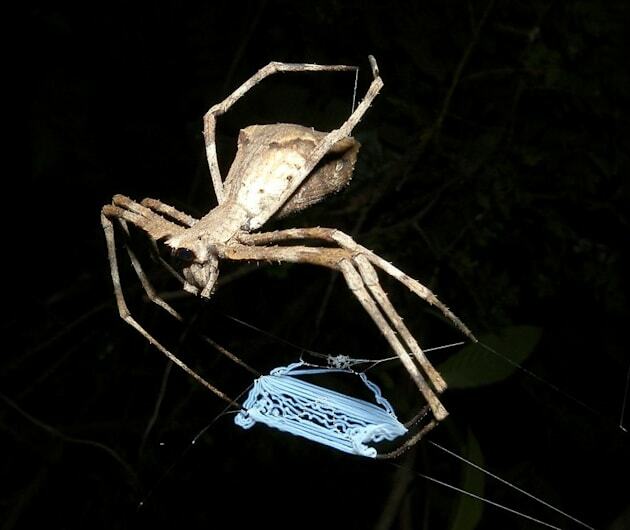 The Net casting spider - also known as the ogre-faced spider. Spiders are an indicator of ecosystem health. Advances in science are also turning spider venoms into lifesavers for humans, with applications being developed to treat cancers and strokes. No-one has actually died from a spider bite in Australia for more than 30-years, but plenty of people have been injured panicking at the sight of a Huntsman! Some spiders are just as beautiful as butterflies. 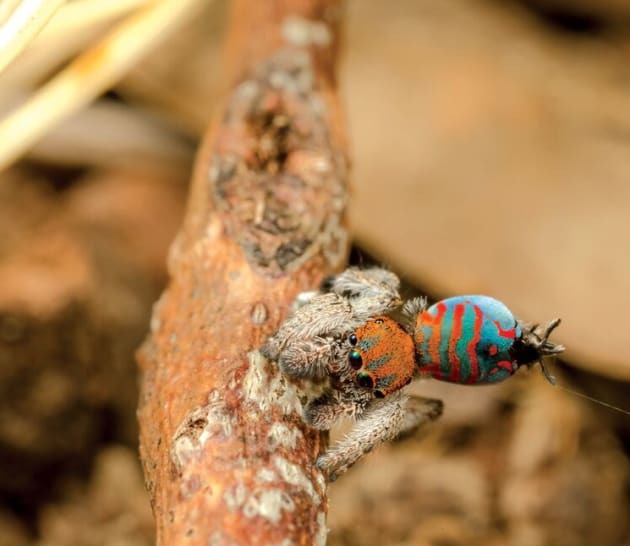 An Australian Peacock Spider with a furry blue face, the Maratus personatus, was named "the World's cutest spider"! 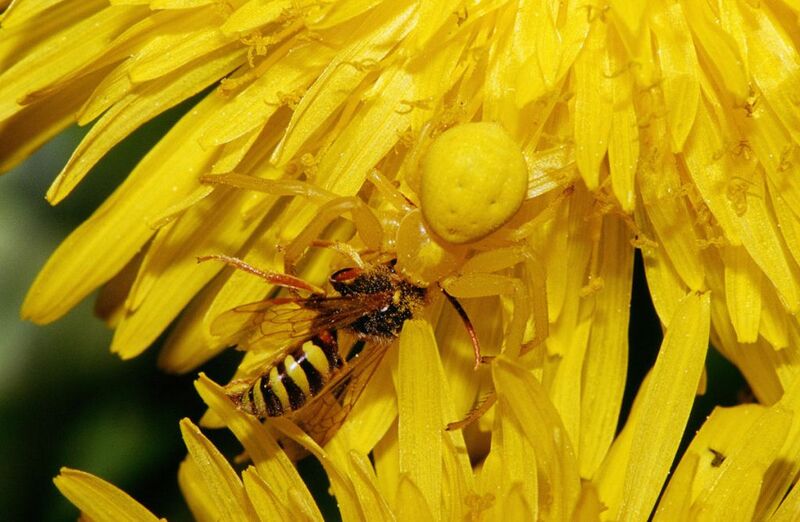 The Crab Spider is the classic 'sit and wait' predator. Imagine, all you wanted to do was take some delicious nectar and suddenly you're having venom injected into you.